After months of speculation over whether Apple Pay would be released in Canada this year, Apple announced an underwhelming market entry on Wednesday, but it will at least be used by one person that we know of. In stark contrast to the launch of Apple Pay in the U.S. and U.K. markets, both of which saw a number of major banks supporting the new technology, there are no Canadian banks partnered with Apple as of yet. 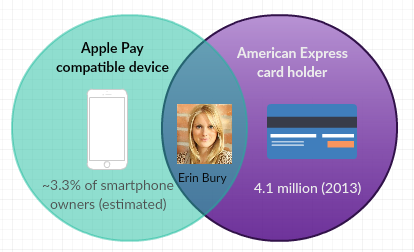 Instead, credit card issuer American Express is going to work with Apple to make its cards compatible with Apple Pay. Much to the delight of Erin Bury, managing director at Toronto-based agency 88 Creative. Bury carries an AmEx Gold card and her new iPhone 6S, so she should be able to use Apple Pay soon. But she’s definitely the exception, rather than the rule in this case. We know that at least one person meets the requirements needed to use Apple Pay in Canada so far. You own an Apple Pay compatible device such as the iPhone 6, iPhone 6S, or Apple Watch. You are an American Express cardholder. You’re shopping at a retailer that supports both tap-to-pay and also accepts American Express. This combination doesn’t seem too likely to occur and it’s hard to know how much iPhone 6 owners could overlap with AmEx cardholders. A bit of number crunching and some estimations help give a more clear picture of the potential user base. We don’t know exactly how many Canadians might own an iPhone 6 or 6S, but we could get a basic estimate by working with numbers provided by the comScore Canada Digital Future in Focus surveys. For example, the 2014 survey (based on the previous year’s data) shows that 19.7 million Canadians owned a smartphone and that 37 per cent of those used an Apple device. That means there were about 6.44 million Canadians with an iPhone at the end of 2013. The next edition comScore survey conducted in 2015 shows that at the end of 2014, there were about 7.56 million Canadians that owned an iPhone. That means there are 1.12 million Canadians that could own an iPhone 6. But since the iPhone 6 was released in September of 2014, it’s likely many of these new iPhone subscribers were still on iPhone 5S or an older model. Of course, no doubt many Canadians have bought an iPhone 6 or even the newly released 6S (as Bury has) this year. A 2013 statistic from American Express shows that there were 4.12 million credit cards in Canada. There’s no guarantee that number has gone up since then, especially since the company saw a partnership with Costco end and would have lost a number of cardholders as that particular card was phased out. Even if a Canadian consumer does meet all these requirements, some retailers don’t accept AmEx. While Bury says she finds that it is accepted at most places, she also carries a backup Visa card for times when it’s not offered. For example, Loblaws doesn’t accept AmEx. We requested an interview from Apple for this story, but didn’t get a response. So if you are one of the few Canadians that falls into the overlapping category, let us know – or else Bury might feel lonely. The Financial Post reports that ScotiaBank’s branded American Express card is not included in the Apple Pay rollout in Canada. That means Bury isn’t eligible for the service after all. Sorry Erin.